My friend, Toni LeBel, recently invited me to come over to her house to make cheese with her. 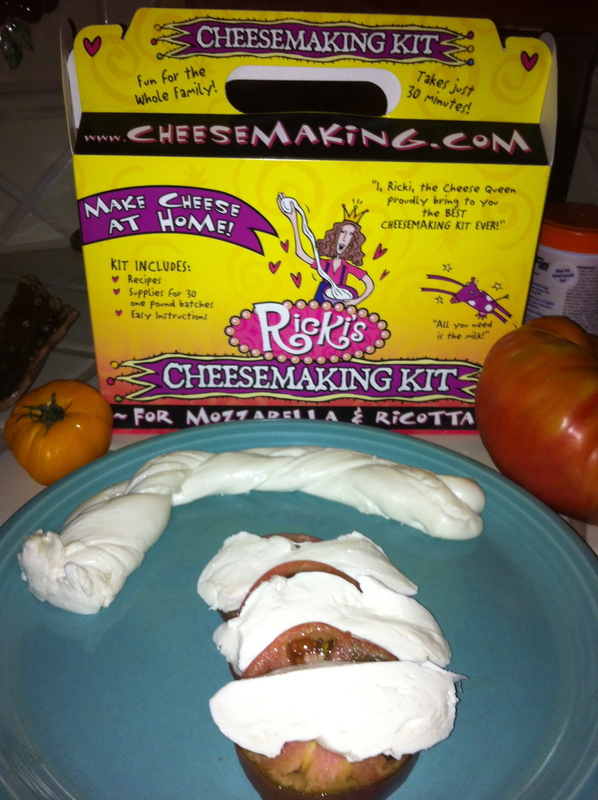 She received her Ricki’s Cheesemaking kit and was excited to show me how we could make cheese in 30 – minutes. All I needed to bring was a gallon of organic whole milk. On the New England Cheesemaking website, we watched Ricki’s step by step video as she made mozzarella cheese. We would pause the video and follow her lead. It was great fun watching the curds separate from the whey and the cheese turn from liquid to a solid. We giggled as we microwaved our curds and stretched them like taffy. In 30 minutes we were eating freshly made warm cheese. What a comfort food! Since Ricki brought us such fun and joy, I wanted to research Ricki and her company. Ricki “The Cheese Queen” is married to Robert Carrol. They live in Ashfield, Mass and started the New England Cheesemaking Supply Company in 1978. Robert studied at University of Mass and Ricki taught elementary school. A neighbor introduced them to dairy goats and soon they learned how to make cheese. They taught friends how to make cheese inside their home. In 1980, took over the New England Cheesemaking Supply Company. I was so excited after the success at Toni’s house that I wanted to see if I could duplicate the joy and satisfaction in my own home with my daughters: Liz and Kate. We watched Ricki in her video and followed each step correctly. Instead of using whole milk, I bought a gallon of low-fat. We stirred, we heated, we scored the cheese, drained the whey, microwaved the curds, and stretched them into long strands. I braided mine and my daughters formed a large cheese ball. Happily we cut a heirloom tomato and ate our warm cheese with big smiles. The kit comes with everything you will need to make enough cheese for quite some time. Go to their Facebook page for a monthly discount or special offer code.